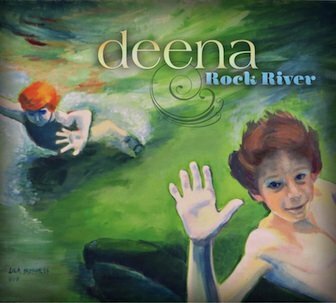 ALBUM REVIEW: Deena, "Rock River"
Rock River, the new solo album from Deena Shoshkes of New Jersey’s The Cucumbers, is a breath of fresh pop air that I welcome. For someone who’s put out great records for over two-plus decades, this album sounds like someone (re)discovering the joys of constructing great, tuneful music. Add to that some great production (by Rob Friedman), which does justice to the songs and you have a fine, consistent piece of work. Starting with the immediate grabber, “My Own Advice”, you’re on a breathless ride of two minutes pop perfection; “Find The Love” has a nice groove and is incredibly catchy. “Bring It All” is a country-styled tune which exudes sweetness; “All She Wrote” is a neat little chugger and “You Will Never Be My Valentine” is one of the album’s saddest songa, yet by virtue of Deena Shoshkes’ vocals, there is a gentility that lessens the emotion behind the lyrics. “Always Tomorrow” is pure Nashville with beautiful pedal steel guitars and subtle rimshots and is (possibly) the album’s most fully realized track. This album is 12 songs of quality songwriting, singing with feeling and production that fits each song – in many ways the different song styles – some pop, some country – make this album read. And I think that may be its secret weapon. Regardless, Rock River is a winner and should find a place in your head. It’s already found a place in mine.